North Atlantic Books, 9781583945018, 240pp. Core Awareness, Revised Edition: Enhancing Yoga, Pilates, Exercise, and Dance offers a guide to Core Awareness, a body-oriented approach that explores the practice of bringing focus and attention to inner sensation as the means of cultivating an innate capacity for expressive movement. 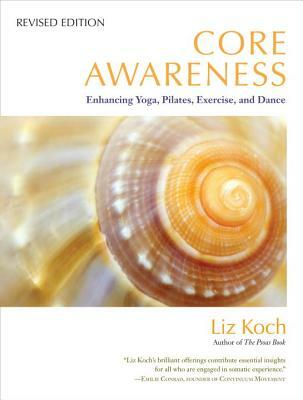 Developed by somatic educator and author Liz Koch, the book's Core Awareness movements, stretches, and mindfulness explorations are designed to enhance sensory development and shift readers from the standard paradigm of the body as an "isolated object" to a holistic paradigm of the human being as part of a living process of dynamic expression. This shift in perspective offers practitioners and teachers of movement, yoga, pilates, bodywork, exercise, and dance an empowering model for self-healing and the key to increasing strength, gaining flexibility, preventing injury, and improving resiliency. Describing the practice of moving from one's core, Koch highlights the importance of engaging the psoas muscle—located on either side of the spine—to integrate the body, mind, emotion, and spirit. Koch also discusses the pelvis as the foundation of our physical core and the vital connection with our bones to gain a sense of support, nourishment, joint integrity, skeletal balance, and healthy muscle tone. Rewritten with updated information, this revised edition includes 247 new photos and 25 new Core Awareness explorations—with 64 in total. A suggested reading list at the end of the book provides resources for continuing the development of the ideas presented within the book. An international somatic educator and author, Liz Koch has thirty years of experience working with and specializing in the psoas muscle. Educating both laypersons and professionals, Liz Koch is recognized by colleagues in the movement, wellness, and fitness professions as a connoisseur of the core muscle of the human body. The author of The Psoas Book and Core Awareness: Enhancing Yoga, Pilates, Exercise and Dance, Koch is the founder of Core Awareness, a somatic approach to deepening the experience of the human core in order to improve skeletal alignment, balance, and orientation. She conducts Core Awareness workshops thoughout the United States, Canada, and the UK. "Liz Koch's brilliant offerings contribute essential insights for all who are engaged in somatic experience." "Liz Koch offers us a rich and profound understanding of movement. Her extensive research on the psoas muscle provides an important entry into the body and leads the reader into an appreciation of a holistic view as opposed to a more familiar idiosyncratic or mechanical view. Every serious student and practitioner will find this book a must for their library." "It seems that yoga classes are offered on every corner these days, but unfortunately they often emphasize movement over awareness, stretching over sensing, and pushing oneself over self-exploration. Luckily Liz Koch's book can offer the yoga student inspiration as well as simple exercises which can create both the depth of feeling and the profound sensitivity necessary to use yoga practice as a physical, mental, and spiritual tool for transformation. I recommend it highly."